Easy to cook, hard to resist. Halal Parve.Mix for rice pilaf layered with meat and potatoes. Bombay Style Pilaf Ingredients Required - Quantity & Preparation: Beef/Chicken/Mutton - 500-750g small cubes with bones Rice Basmatti - 500-750g / 3-4 cups washed & soaked for 30 minutes Onions - 5 medium finely sliced / 2 1/2 cups / 300g Tomatoes - 4 medium chopped / 2 1/2 cups / 300g Potatoes - 3 medium peeled & halved / 250g Ginger - 3 tablespoons, chopped / 2"piece / 25g Garlic Paste - 1 tablespoon, heapful / 25g Yogurt, Plain - 1 cup, whipped / 200g Ghee/Oil - 1-1 1/2 cups / 175g-250g Shan Bombay Biryani Mix - One packet STEPS OF COOKING 1. Fry the onions in hot ghee/oil until golden. Add tomatoes and fry until the oil separates. 2. 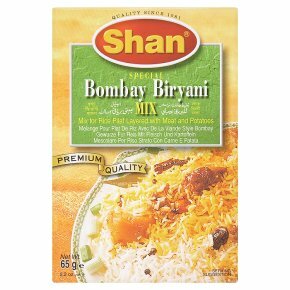 Add meat, garlic, ginger, potatoes, yogurt andShan Bombay Biryani Mix. Fry for 15 minutes. Add 1-2 cups of water and cook on low heat until the meat is tender. Then increase heat and stir fry until oil separates from the gravy. 3. Separately: In 12 glasses of hot water add 3 tablespoons of Shan Salt and the soaked rice. Boil until the rice is more than half cooked. Remove from heat and thoroughly drain the water. 4. Spread the cooked meat and curry over the rice in two layers. Cover the pot and cook on low heat until the rice is fully cooked and tender. Mix before serving. SERVING SUGGESTION Serve with fresh salad and raita. TIPS FOR BEST RESULTS Meat: use breast, ribs & shoulder cuts. Serves 6-8 persons.